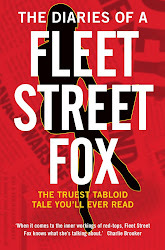 fleet street fox: Being good is bad for you. AT last! Someone has proved what we all knew if we only stopped to think about it. Boffins at the research institute of Liverpool John Moores University have found that people who exercise regularly put so much strain on their hearts that it's unhealthy. Specifically, your heart will be asked to do so much more than it wants to that it will grow fibrous tissue which may affect its ability to beat properly. Or, to quote the science: "Lifelong repetitive bouts of arduous endurance exercise may result in fibrotic replacement of the myocardium in susceptible individuals, resulting in the development of arrhythmias." Which is not to say that regular, lighter exercise isn't a perfectly good idea. A little trot around the park, a long walk on a sunny day, a regular swim or cycling to work - as long as the route doesn't involve a city centre, of course, in which case you may as well just take yourself off to Dignitas and commit suicide without being smeared across the front of a lorry - are all a great idea. But it's a justified kick in the crotch to the humourless health nazis who insist that if you don't run the marathon every year you're pretty much dead, the people who shun red meat after 5pm, drink smoothies made from grass and treat a biscuit like it's a brain tumour. The ones who say that eating five fruit and veg a day is for people who don't try hard enough. And - I'm almost sorry to do this to the health nazis, who seem to have a fairly miserable time of it already - dentists have announced that the five-a-day thing is also bad for you. Kathy Harley, the dean of the dental faculty at the Royal College of Surgeons, says that the fashionable insistence on drinking fruit juice and eating citrus is adding lots of extra acid to diets which strips the enamel off our teeth. Children are suffering the worst, with half of five-year-olds are showing signs of losing their enamel. You may be having a great diet, your teeth may be lovely and white, but without enamel they're going to rot right out of your mouth. Seeing as enamel is the toughest substance in your entire body, it takes some doing to get rid of it. Dentists would rather we ate fruit at mealtimes rather than as snacks, avoid juice altogether and give children milk to drink instead. Aside from the fact that without juice vodka mixers are going to be quite boring it all sounds perfectly reasonable to me. Of course milk is good for your teeth and bones. Of course you can damage yourself by exercising too much. Of course you need fruit and veg in your diet, along with everything else. It's a good thing we have boffins to point out the bleeding obvious sometimes but there's no reason that we can't figure it out for ourselves. You can tell exercise is good for you because it makes you feel better when you do it, whether it's horizontal jogging or going round the park. Pheromones fire in your brain, your feet skip, and you smile. I did eight miles' training for the Moonwalk on Sunday and while my legs ached afterwards I felt great for it (I am also, once it is done, never walking anywhere again). Consider eating a bowl of strawberries, even without cream and sugar, a big plate of baby carrots or - my personal favourite - steamed spring greens with a bit of salt and butter. Just thinking about it makes you feel better, and eating it doesn't hurt either. But imagine a diet that involves a drink made from grass and most of us pull a face, not least because our brains and instincts are cleverer than we give them credit for. They know damn well we're not built to eat grass and that's why they tell us to vomit when we do. My gran always used to say that a little of what you fancy does you good. It's true she usually said this while serving up second helpings of steamed treacle sponge with custard, but she was right because we didn't eat it every day, we always went for a big walk afterwards and she made a damn fine treacle sponge. Which is as good a philosophy for life as anyone else's, and on the plus side you won't end up looking like Madonna.